Home What is the sharing economy? Whether you realise it or not, you’ve probably encountered the sharing economy today. Surprised? Don’t be - it’s only going to get more popular. The sharing economy is a socio-economic system based on the sharing of under-utilised resources. It usually comes in the form of renting, loaning, gifting, swapping or shared ownership and is more often than not run on a “two-sided market” hosted by a third party. Unused value is opportunity, not waste. The sharing economy takes the perspective that unused value is not waste, but an opportunity. The sharing economy has something to make better use of just about any under-utilised resource - money, clothes, homes, cars, even non-tangible resources like skills and time. Your unused spare bedroom could earn you hundreds of dollars a week on Airbnb, while the boxes of old clothes in your wardrobe could fetch a small fortune on Trade Me, and some of those stashed away savings could be earning decent interest through Harmoney. You can even earn money sharing your knowledge. Apps like Skillshare and Udemy allow individuals to enrol in online classes taught by experts in anything from graphic design to mathematics. The sharing economy is growing rapidly, alongside what many are calling the “pay as you live” generation - a growing trend in which access to resources trumps ownership of them; where a Spotify subscription is preferable to hundreds of CDs, Netflix preferable to DVDs. This shift towards access goes even further - with many in the US & UK ditching their cars in favour of car-sharing services like ZipCar. The sharing economy is almost everywhere. 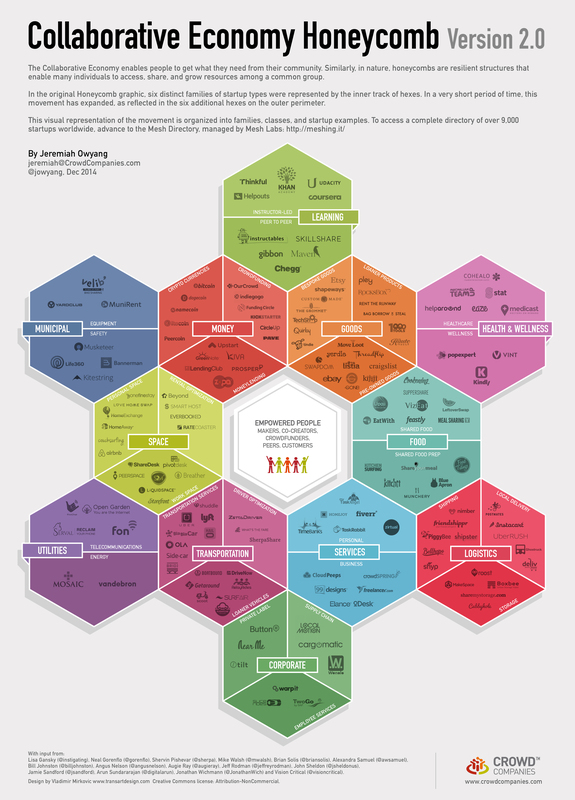 Check out this great infographic made by Jeremiah at Crowd Companies to get a sense of just how far the sharing economy reaches - from health, money, logistics and food to education and more. Still not convinced that the sharing economy is such a big deal? Let’s put some hard numbers behind it then. Airbnb is the world’s most popular home-sharing service, connecting people looking for accommodation with “hosts” looking to rent out rooms or properties. It has listings in 192 countries, on almost every main street from Paris to Porirua. In February this year, Airbnb was said to be raising $1b of funding with a valuation of $20b - doubling its valuation in one year. For comparison's sake, the almost 100-year-old Hilton Hotel Group has an estimated value of $30b according to the NYSE (as of April 2015). Airbnb has reached its $20b valuation in the short space of 7 years. Lending Club, the largest P2P lending platform in the US, was #5 on Forbes’s most promising companies in America list for 2014. The platform raised nearly $870m in its IPO on the NYSE last December, giving the company a valuation of $8.9b - a higher valuation than some of the largest banks in the US. Kickstarter is arguably the best known global crowdfunding platform. Since it launched in 2009, over $1.6 billion has been pledged from over 8m people to over 80,000 successful Kickstarter projects. New Zealand’s own Trade Me, the country’s largest online marketplace, has amassed over 3.6 million active users (in a country with a population just over 4 million) since launching in 2009, and almost 800,000 visitors every day. The company has an estimated value in excess of 1 billion. Plus here at Harmoney, NZ’s first peer to peer lending service, we were the first in our industry to launch with $100m in institutional funding, with thousands of Kiwis borrowing over $50m from thousands of investors. The sharing economy is only going to spread further. It’s the perfect time to get on board.